The adjustable handle can be placed in five grip positions, from 1.375 in to 3.375 in, in half-inch increments. 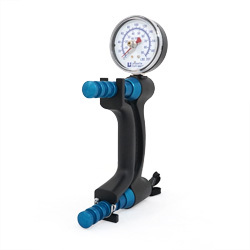 This sealed hydraulic system features a dual-scale readout that displays isometric grip force from 0 to 200 pounds (90 kg) with accuracy within 1%. Lafayette Instrument also calibrates the Lafayette (J00105 and 5030L1) and JAMAR (5030J1) Hand Dynamometers. If you are interested in this service, check out our Calibration Return Form.